The Internationale Scheldecommissie / Commission Internationale de l’Escaut is, as the webpage proclaims, "an intergovernmental body for sustainable management of the Scheldt river district". Starting out as the International Commission for the Protection of the River Scheldt (Treaty of Charleville-Mézières, 1995), the ISC was defined by the Treaty of Ghent, 2002. The territory concerned consists naturally of the river’s bed and tributaries but also includes the local seacoast. The six parties involved show their flag - besides France, Belgium and the Netherlands it is important to know that the three Belgian regions Wallonia, Flanders, and Brussels have - to the extent of their competences - the right to sign international treaties. Each country or region, in turn, exercises the chairmanship for two years. 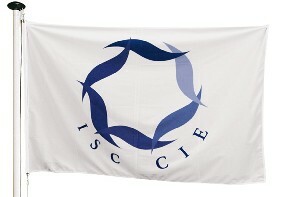 Commision’s flag: white, the logo placed in the centre above serifed dark blue acronyms "ISC SCI" placed in a bow. The logo itself is made up of six waves placed in a circle, the one at upper light being light blue and the others gradually (clockwise) becoming darker.